Why do weekends always pass so soon? I can't believe it's already Monday! How was your weekend? I felt like starting this week with yet another Resort 2012 collection that I love very much: Moschino. It feels a bit preppy chic to me, the outfits below are my favorites. If you'd like to see more go visit Vogue. Most of the decor images are recently saved inspirations from the fabulous Lonny decorate files. Hope you have a lovely, new week ahead of you! Oh my Christel, what a pretty post! ohh, this is one of my favorites post of yours, love Moschino and love decor, simply amazing! I had a great weekend & wish you a wonderful week ahead! Ahhh I love Moschino! So playful and pretty... and now I'm pining away for that white skirt. So gorgeous! Love it when you do fashion/decor pairings!!! We're off to a lovely start to the week here. Little boys in summer camp by the beach, seeing friends and getting ready for an overdose of red, white and blue! Hope you have a lovely week, Christel! Oh dear! 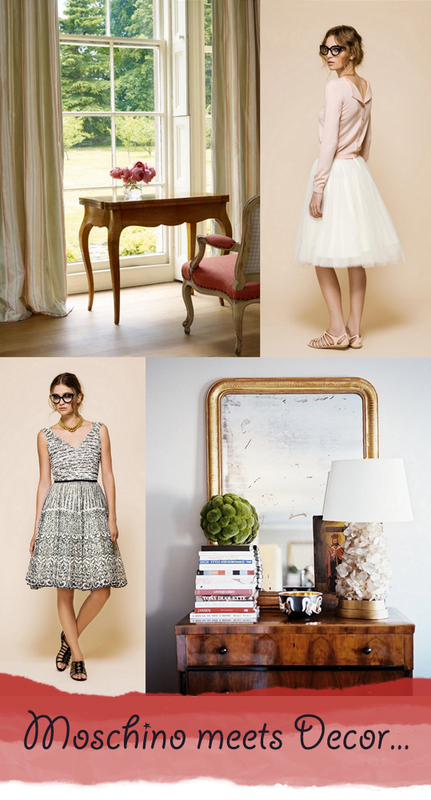 Christel these pairings are lovely :) I adore all the decor photos and the outfits! My favourite is the ballerina inspired look; how exquisite to have a sweater with buttons up the back ;) And the corresponding decor is just so light and carefree!